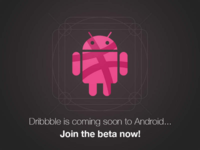 I'm working on my android Dribbble client and I'm currently wondering if I should use version 1 or 2 for a shot's screen. Version 1 : there's a FAB to like a shot and a menu item to add it to a bucket. Clicking on the number of likes shows people who liked the shot and clicking on the number of buckets shows to which buckets it was added. Version 2 : no FAB or menu item. Clicking on the number of likes allows you to like the shot and clicking on the number of buckets allows you to add to your bucket. Could you give me feedback about what you'd like more?